Any time there is a significant Native blockade or occupation, there are demands for its immediate removal by angry citizens. 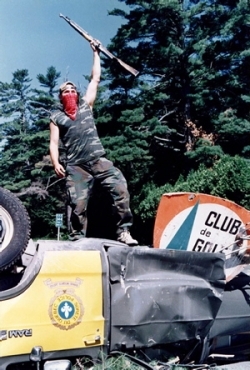 During Oka, 1990, and Six Nations 2006, for example, mobs of non-Natives rallied and sometimes rioted demanding that the military intervene to end the disputes. Likewise, judges have scolded police forces who did not immediately enforce injunctions that they issued against blockades or occupations. 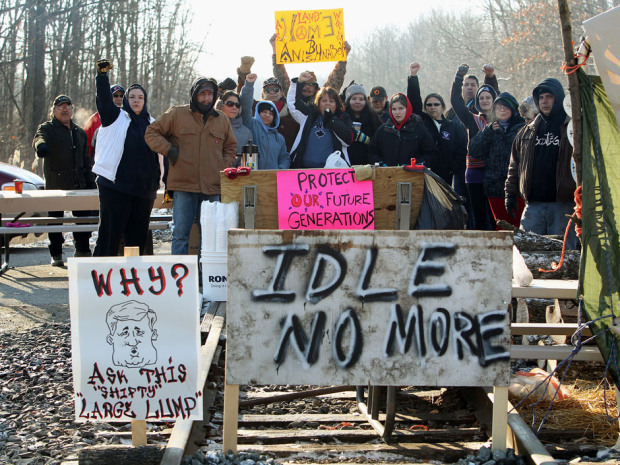 A recent example was seen in Sarnia, Ontario, where Natives blockaded a CN rail for several days as part of the Idle No More mobilization. In late December, Ontario Superior Court Judge David Brown issued an injunction against the blockade. Sarnia police never did enforce it, and instead the blockade was voluntarily dismantled by protesters. Then on January 5, 2013, the same judge issued an emergency injunction against a train blockade carried out by Tyendinaga Mohawks. Citing tactical reasons, the Ontario Provincial Police (OPP) did not intervene, and the blockade was voluntarily taken down after a few hours by the Mohawks. Last spring, B.C. Supreme Court Judge Mark McEwan criticized the RCMP for failing to enforce an injunction against the blockade of the Gitxsan Treaty Society by grassroots Gitxsan (after Elmer Derrick, head of the GTS, signed a multi-million dollar deal with Enbridge). The blockade, which began in early December, 2011, lasted for several months and only ended when a deal was reached whereby an audit would be undertaken of the GTS finances. Many Idle No More rallies have seen little police presence, aside from redirecting traffic, even when several hundred people are marching. Blockades of highways and city intersections have lasted at times for 3-4 hours. Hundreds have “flash mobbed” into shopping malls, causing minor disruptions to business-as-usual, with little police response. Some INM participants see this as proof that “peaceful” protests are effective, that police don’t know how to respond to them, etc. But it would be good to remember that the Occupy protests of 2011, even though being almost entirely nonviolent, were squashed with court injunctions and the frequent deployment of riot police. Even the first Occupy rally in Vancouver, on October 15, 2011, saw scores of riot cops in the streets. What all of these people—the reactionary citizen, judges, and the naive INM participant—don’t realize is that the reason the state and its police forces “fail to act” is that they fear the greater potential disruption that Indigenous peoples are capable of. The state does not want to radicalize a passive reformist movement through overt repression, and will tolerate acts of civil disobedience (including temporary blockades of infrastructure). 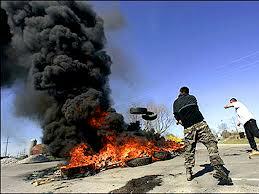 Six Nations 2006: grassroots Indigenous resistance in action. The greater potential for disruption is not merely a phantom menace, but has been seen before. During the Oka Crisis of 1990, for example, it was the widespread and militant solidarity actions carried out by grassroots people that limited the state’s military options in ending the standoff. These solidarity actions included protests, blockades of highways, railways and bridges, occupations of government offices, as well as sabotage of railway bridges and power lines. The state knows that Indigenous populations are, in rural areas especially, strategically located to cause massive economic disruption. This includes blocking or cutting highways, railways and power lines that cross through Indigenous territories and reserve lands. In addition, the Indigenous grassroots has demonstrated a capability for militant as well as armed resistance, as the examples of Oka 1990, Gustafsen Lake and Ipperwash 1995, Burnt Church 1999-2000, Kahnesatake (Oka) 2004, Six Nations 2006, etc., clearly show. 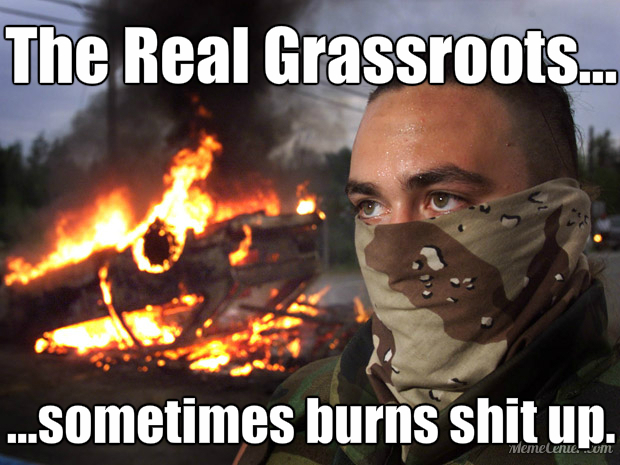 So while some INM’ers believe they are leading a “peaceful” Indigenous Rights Revolution, they are actually benefiting from the militant grassroots resistance that preceded them, gained through blood, sweat, and tears, assaults, arrests, and in some cases death. Perhaps if they knew their history better, they would understand this.